Chilled water is most essential part of the manufacturing process for various industries like plastic injection Moulding, Heat treatment furnace oil cooling, Black Anodizing, Vacuum pressure, impregnation etc. Temperature Controller : Micro processor controller with high & Low Temperature Alarm with tamper proof keypad lock, on Demand with PLC Controller for precise controller for precise control. Safety control : Safety controls like Hp/Lp cutout, Antifreeze Thermostat are employed to protect the system parts severe damage. Specially Designed for high amb temperature in imported high quality inner grooved copper tube. 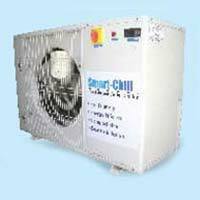 With Exhaust Fan on customer's Request we can provide split Type chiller. Exhaust Fan 1 No. 1 No. 1 No. 1 No. 2 Nos. 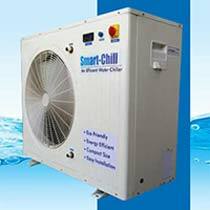 Chilled water output with temp difference between inlet & outlet water temp 16oC.